Windows Phone users can enjoy some new features on their handset once they download and install the Gestures Beta app, available from the Windows Phone Store. With the app, Windows Phone users will be able to pick up their ringing phone, put it to their ear, and take the call without touching the screen. Want to mute a call quickly? With this app, you simply place the handset flat on a table, display-side down, and the caller will be unable to hear you making fun of him. If you place the phone flat on a table with the speaker-side up, the speakerphone goes into operation. Best to make sure that you remember which gesture turns the speaker on and which one mutes your phone. If you forget which does which, you could make a mistake fatal to your career! Note that those sporting the Nokia Lumia 630, Nokia Lumia 635 and Nokia Lumia 530 will have limited functionality with the app. 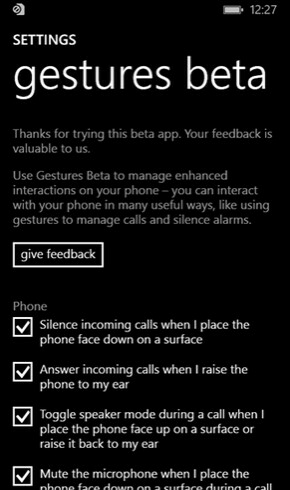 The Gestures Beta app is a free download from the Windows Phone Store, and allows you to answer the phone, enable the speaker or the mute button, all without touching the display. Make life easier for yourself and install it on your Windows Phone handset today. I can`t get it on my M8. Says it is not compatible for some reason. I will try again later. Maybe it is exclusive to lumias? Because M8 has frontal stereo speakers and orientation sensor doesn't recognizes? Idk but just a guess. This app is exclusive for Lumias , tried it , its so cool! Darn. Wanted to try it. They should really specify that in the article. This is an interesting app.. If I had a wp device I'd use this for sure. These are all ripoffs of TouchWiz features. It is annoying how people dismiss TouchWiz as gimmicky when it inspires many. You still waving with your hands to scroll? Ripoff? Really? You clearly hate Windows Phone OS. Nokia had glance before LG's knock code and Moto's Display. Should i consider these to be ripoffs? And what does this feature has to do with the gesture to scroll and answer calls?? They are ripped off the "gimmicky" TW, as always. I won't argue.But stop using the word 'ripoff'. Or call knock code and moto's display ripoff's too. Glace wasn't like Moto's Active display upon its arrival. You wave your hand in front of it or pick up the phone to activate, not let's just keep the screen on always or for a predetermined amount of time. Nokia later added the wave feature. Moto had it first. And seeing how Nokia debuted it in Jun of 2013 and the Moto X came out with it in August or so, I can't really say they copied it. have you ever use nokia n9? many touchwiz gestures originate from meego. samsung realy like meego even tizen is child of meego. before thinking sammy invent those gestures do some research. if you want to prove go youtube/google then search "air ui n9"
Hm that is true, cool that they had it, though I will gladly admit I didn't remember that feature until you mentioned it, it was there, didn't work that well and that's probably why we don't remember. Unfortunate, but then yes, credit where credit is due, n9 did it first, samsung adopted it, and now others are adopting it, still a good thing since they can be quite useful. The rule is, if Touchwiz has it then it's a gimmick. If any other company has it, it's innovative. It is other way around. If WP has kids corner, it is useless. If Samsung and LG adopts, PA and all WP haters will say, Samsung introduce the cool feature, etc. That's fact. My WP7 HTC Trophy had the feature where flipping it face-down while on a call would automatically turn on the speaker, and flipping it back would turn off speaker. I believe it also had the ability to silence the phone in the same manner, if I recall correctly. Not sure if this was before or after TouchWiz included the feature, but that was in 2011 and it's nothing novel to either platform, so let's all just stop the proverbial "that's mine!" Lumia's have had the flip to silence feature since 2011. Earlier that year the Nokia N9 had many of these features too. There are many useful TW things, the problem is that it slows down android. Will this slow down my 925? Probably not. Its a gimmick when Samsung advertises Smart Gestures, they just build the hype like its the best next thing and when you experience it, it was 'meh'. On the other hand, other devices advertise it too but they simply say we had this simple gestures. Period. No build up whatsoever. My old HTC Touch Pro 2 on Windows Mobile had the feature to turn on speakerphone if the device was placed face down. In fact, the mute button was on the back cover so it was easy to mute in case something was not meant to be heard. It also had the feature to quiet the ringer when picking up AND it used a stylus. I guess TouchWiz ain't so innovative after all. Nothing new here folks. Works great on my 520, 925, and 1020. Nice not having to take the extra moment to select the "answer" button for incoming calls. Guys stop,actually nokia has patent on gestures based innovation and Samsung pays royalities to Nokia for using it in their phones...but they were overlooked by Microsoft and they did never use it.but now they found the real imp of this. When did Palm sell the intellectual rights to Nokia? webOS had a full gesture-based OS long before Nokia even had a capacitive display.